We have already seen that work is best executed using the Task list folder. But just making a list of tasks with deadlines is not enough. We need more information – how much time will each task ACTUALLY REQUIRE to execute. Duration can then be used to sort / filter pending tasks and choosing the right task depending upon time available at hand. This article assumes that you are using Outlook (and Exchange server) for managing mails. However, the concepts explained here are applicable to any mail / messaging system. However, the remedies mentioned are specific to Outlook-Exchange only and may not work with other products. You send mails and others send mails to you. 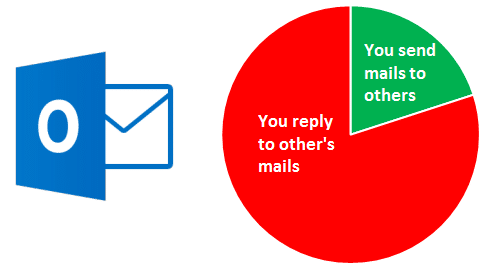 Naturally, the number of mails you mails you RECEIVE are going to be more than mails you SEND. When you send a mail you are trying to do YOUR WORK. When you reply to someone else’s mail, you are helping OTHERS do their work. Similarly, the number of meeting requests you SEND are bound to be much lesser than the number of meeting requests you RECEIVE.When you arrange a meeting, you are trying to get YOUR WORK done. When you attend a meeting called by someone else, you are helping OTHERS get their work done! When you say I spend so much time cleaning inbox, do you realize that you are spending that time helping helping OTHERS ? Question: When do you do your work? And whatever time you have you are literally WASTING in helping others! Of course, I am not against you helping others. Everything we do is teamwork. But this is a highly skewed version of teamwork. You are helping others at the cost of your own work! Now let us try to pin down the root cause. When you or others look at your calendar, the time which is not blocked for formal meetings is considered as FREE. Others are free to request a meeting with you during the FREE time! The question is – are you really FREE during that time? Is it not the time you get to do your own work? But somehow, your actual work is never visible in the calendar. That is the root cause of Outlook paradox. It is surprising that this simple and obvious fact is ignored by billions of people every day. The solution is simple. Stop using Outlook the way you currently are. Turn the tables. Be focused. Do your work first and then help others! Realize that TASK folder is the most important one! In the next few articles, we will learn these steps in detail.